I have a question??? I cannot remember ever hearing birds tweeting all night long!!! Seriously it's like from Midnight to all day. They quiet some about mid day, but then start up again at midnight. I think I'm going to lose my mind!! Don't get me wrong the birds are magical to watch in the fountain during the day, but I'm at my wits end. It's been a week of sleepless nights, and earplugs cannot be worn else I'll sleep through the alarm clock. Can you explain this? What kind of birds are these, and is it a migratory thing? Thank you for your question, Audry. This is a common question around this time of year. It is spring, and in spring, birds establish territory and look for mates. They do this by singing. And singing. And then singing some more. Sometimes as birds shift territories, you become the lucky one who gets the loud singers in your front or back yard. I remember years ago I had problems with loud Northern Mockingbirds. For over a decade now, I have been lucky and have had no springtime serenade. The most likely candidate for your loud, singing bird is the Northern Mockingbird. The Northern Mockingbird is loud and has varied songs and sounds. It sings for long periods of time. Another bird that does sing at night on occasion is the American Robin. See my post "What's That Singing in the Night?" 1) While ear plugs or noise cancelling headphones are helpful, there are other solutions. White noise is a good idea because it will help block the noise. You can buy simple white noise machines for various prices or make your own by having your CD player on continuous play, using your iPod, or turning on your TV to a channel with no station broadcasting on it. Even a channel with a real station might do the trick. The idea is to have any kind of noise like static, music, rainfall, waves, a babbling brook, wind, etc. Therapists have white noise machines for privacy, but you can use the same thing for sleeping. The continuous, steady noise overlays the bird songs and makes them stand out less to your brain. It is best if the sound source for the white noise is between you and the window. White noise usually does not prevent a person from hearing their alarm, but you may want to try it out first to see if you can hear your alarm with your white noise turned on. Better than finding out after you are late for work. 2) If you can, make sure your windows are closed to minimize the loud singing. 3) Relaxation techniques can also help. Sometimes it is not so much the sound as it is our reaction to it. Much the same as not being able to sleep is upsetting, and so once you begin to have trouble sleeping you stress out and can't sleep, when the bird starts singing, you get stressed and have even more trouble sleeping. So stress about not being about to sleep can contribute to not sleeping. Check out these sites for information on relaxation techniques: The University of Maryland Sleep Disorders Center has some excellent information for those with and without sleep disorders. Here is the section on relaxation techniques-- and see these relaxation techniques from WebMD http://www.webmd.com/balance/stress-management/features/blissing-out-10-relaxation-techniques-reduce-stress-spot. You might even try using a relaxation tape which would effectively combine suggestions 1 and 3. 3) I would also suggest a few other things that are just for good sleep in general. The reason being that the less ready you are for a nice, restful sleep, the more the birds singing will bother you. The more ready you are to sleep, the more likely you are to sleep through the Mockingbird's Anvil chorus. A) Have a regular schedule for your bedtime and waking up. B) Eat well and remember to keep hydrated during the day. C) Exercise during the day, but avoid exercising within two hours of your bedtime. D) Avoid caffeine. As tempting as it is to use it to keep yourself awake during the day, if you are using it in the late afternoon, you are risking keeping yourself up at night for the avian concert. E) Avoid using alcohol to sleep because it will not keep you asleep and can in fact wake you up during the night. F) Avoid foods that are hard to digest due to high fat or spicy, or that raise your blood sugar a lot. These can also keep you up. G) Although adults don’t want to have their favorite story read to them before bedtime, we do best with bedtime routines that help prepare us for sleep. Repeating the same routine before bed can help you prepare for sleep. For more advice, read Sleep Hygiene from The University of Maryland Sleep Disorders unit . Hope this helps and that you can get some sleep. Thanks again for your question. What's That Singing in the Night? 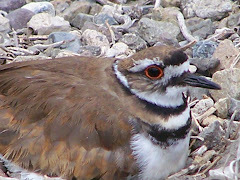 Went out early on Sunday 05/02/2010 to walk and bird at San Joaquin Wildlife Sanctuary. It was a beautiful morning. Didn't see any unusual birds, but it was very relaxing. I was able to watch a lot of familiar species and really appreciate their beauty and behaviors. American Avocet strains the mud for food. In the first pond, American Avocets were moving their bills back and forth through the water and the mud. Cinnamon Teals were dabbling in the shallows. Anna's Hummingbird perched and watching as they often do. An Anna's Hummingbird sat on the bare branches of a bush flycatching. Song Sparrow--note the spot in the middle of his chest. Great Blue Heron stands on the path after flying toward me and landing not far from me. Pretty bird. This Great Blue Heron didn't care how close I was. Raggedy Turkey Vulture in the middle of a molt. Two Great Egrets bookend a Snowy Egret. Great Egret flew a bit farther from me as I got closer, but not that far. I know it's not a bird, but I love bunnies. This was a little baby one. The walkway across the marsh and streams. Another song sparrow. This one is belting out his favorite courting song. This Common Yellowthroat sings from the marsh grasses. Spotted Towhee sings over by the buildings as I leave. You can usually spot Western Bluebirds as they fly down from the trees to the ground to forage and fly back up. This is how I spotted this female Western Bluebird. 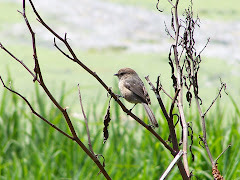 Mason Regional Park is always full of singing Song Sparrows and Common Yellowthroats. Black-crowned Night Heron sitting on the railing overlooking the lake at Mason Regional Park. As I approached the look out, I saw a Black-crowned Night Heron fly in. He stayed there while people passed by, and I was able to come fairly close and take pictures and video. Zooming in on the Black-crowned Night Heron. I didn't put my digital camera on the recharger correctly the night before and it didn't charge. Consequently, I kept having to turn off my camera to conserve batteries. Luckily, they lasted my entire walk. I love this view of the bridge. This is an Egyptian Goose. There are quite a few in Orange County. They are descendants of escapees from private collections. The first time I saw an Egyptian Goose, I thought it was a weird park duck. Then I saw a few others who also looked exactly the same. I thought, duh, it is an actual species. So I looked it up. There are escaped Egyptian Geese scattered all over Orange County and in Southern California. They can be fairly quiet, and then start cackling and hissing. With a few together, it can get quite loud. Ruddy Duck drake takes a swim. Staying on the surface cruising. The breeze blew the surface of the water causing little ripples. Male Western Bluebird flies down and checks me out. He flew in just a few feet away. I don't know what was up that day, but several birds flew in really close to me. This male Western Bluebird flew down very close to me just a few feet away. I was lucky to be able to focus on him. 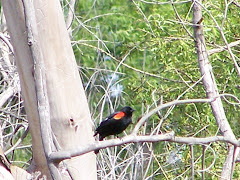 It was a great morning birding in two great birding hot spots--San Joaquin Wildlife Sanctuary and Mason Regional Park. When you are out birding in Orange County, try to visit two birding spots that are close together. Slightly different habitats can yield different species. And birding several different places is just plain fun. Craig Regional Park is a beautiful park with rolling grassy lawns, lots of trees, two year-round creeks, and a small lake or pond. In addition, there is a small nature center, a rose garden, barbecues, picnic tables, baseball fields, basketball courts, bike trails, and lots of sidewalks to take long, peaceful strolls. It is a nice place to walk and listen to the birds. A great place to bird. The park is 124 acres and is located in both Fullerton and Brea near the Fullerton Dam. A closer look at a narrower portion of the lake. Craig Regional Park is named in honor of Ted Craig who was an active city council member, mayor of Brea, member of the state legislature, and regent of the University of California. He was active in the 1920s and 1930s. He spent his life in active public service to Orange County. Nest box for the many Wood Ducks who live and nest here. The park has many resident Wood Ducks who are cavity nesters, and there are many nesting boxes for them to use. (Update June 2015: Most if not all of the Wood Ducks who used to frequent Craig Park have moved on, and all but one of the nesting boxes have been removed. You will find Wood Ducks in the eastern end of Orange County now. 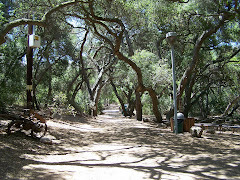 Irvine Regional Park, Oak Canyon Nature Center, etc.). A bluebird nestbox for the Western Bluebird who breeds in Orange County as well as other parts of California. Also present in the park are Western Bluebirds. 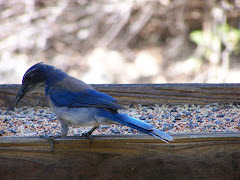 Western Bluebirds are also cavity nesters, and there are many bluebird boxes for them in the trees throughout the park. Female Wood Duck and her 9 ducklings. The park's lake is stocked with fish and allows fishing with a permit. Of course, this also attracts the usual fish-eating crowd of Black-crowned Night Herons, Snowy Egrets, Great Egrets, and Great Blue Herons. In addition, there are usually a few Double-crested Cormorants fishing in the lake. They need no permit. Black-crowned Night Heron looking for a good fishing spot. This was at almost 11AM. There are Mallards, Pied-billed Grebes, and the usual assortment of domestic ducks, and a few escaped Egyptian Geese. Female Western Bluebird feeding her nestlings. As I walked through the park, I saw a Western Bluebird couple attending to their babies. The male Western Bluebird keeping watch. He flew off with the female when she emerged from the nestbox. One of the streams meandering through the grass at Craig Regional Park. The streams are used by the ducks, egrets, and herons as well. California Towhee among the flowers. Female and male Wood Ducks pause on the sidewalk before flying up to the chain link fence. Since Wood Ducks are perching ducks, you can see them in places you would never find a Mallard. Wood Duck drake finally swam close enough for a decent shot and in decent light, too! This Wood Duck took quite a while to groom himself before returning to the water. I enjoyed walking around the lake. Snowy Egret striding purposefully to the water. Female Mallard and the petite Snowy Egret. Across the lake another Snowy Egret. Notice that a Snowy Egret is not very big compared to a female Mallard. Non-birders often mistake mature Snowy Egrets for baby egrets when the Snowy is standing next to a Great Egret which is also white. This American Robin tilted his head often to the side, listening for yummy bugs in the grass. A female Mallard with two of her three ducklings. It was a peaceful relaxing morning of walking and birding. So if you are thinking about a place to bird in Northern Orange County, try Craig Regional Park. 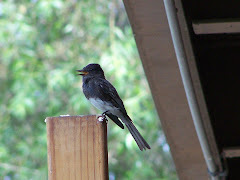 It is a great place to go birding in Orange County.